Director/Screenplay/Producer – Maurice Devereaux, Photography – Denis-Noel Mostert, Music – Martin Gauthier, Visual Effects – Jean Renaud Gauthier & Martin Gauthier, Makeup Effects Supervisor – Adrien Morot, Makeup Effects – Maestro Studio FX, Production Design – Jean Philippe Hebert. Production Company – Maurice Devereaux Productions, Inc/Maestro Studio FX. The nurse Karen is riding home from work on the subway when the train abruptly stops in the tunnel. This is because Patrick, a creepy guy who was coming onto her on the station platform earlier, has pulled the emergency stop so that he can force himself onto another girl Julie. As the passengers wait in the tunnel, a number of them, including Patrick, receive pager messages. They are all members of the religious cult Voice of Eternal Hope and, as directed by the pager messages, produce crucifix daggers from their satchels and begin slaughtering everybody who is not saved. 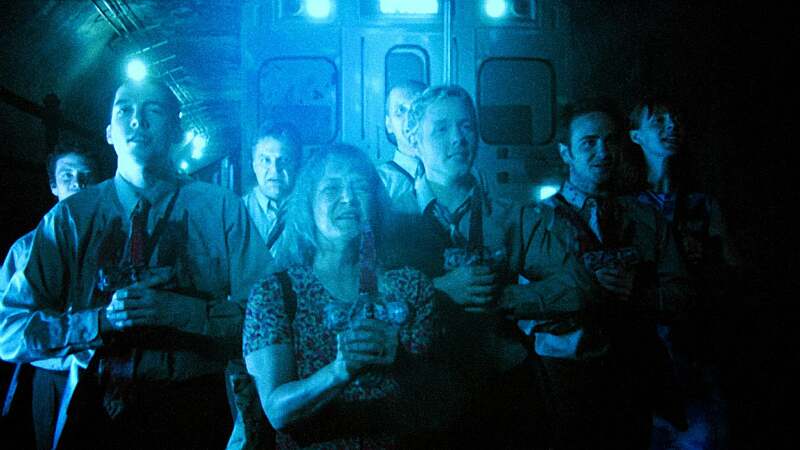 As Karen and others group together to flee, they find the cult members are everywhere, while outside the apocalypse they are greeting appears to have started. Maurice Devereaux is a Quebecois Canadian director. Prior to End of the Line, he had previously made three low-budget ventures into horror material, first as co-director of Blood Symbol (1992), also about the activities of a cult, and then as solo director of Lady of the Lake (1998) and Slashers (2001), neither of which have received either particularly high profiles or good reviews. 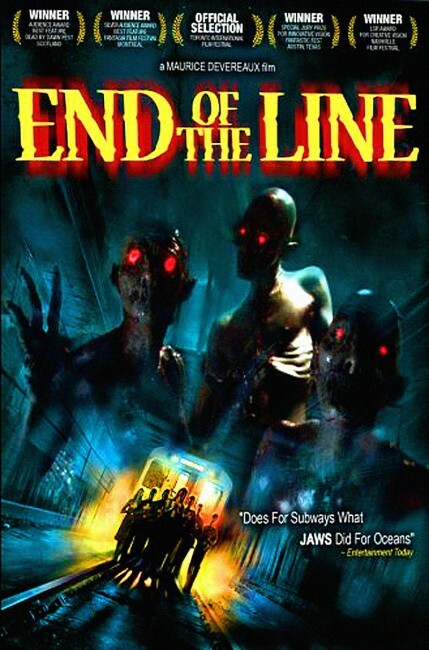 End of the Line is co-produced by Montreal’s Maestro Studio FX, the makeup studio headed by Adrien Morot and responsible for work on Night at the Museum (2006), 300 (2007), Death Race (2008), Warm Bodies (2013) and X-Men: Days of Future Past (2014), among a great many others. End of the Line starts off promisingly. Maurice Devereaux gets off some effective jumps – Ilona Elkin sitting in a subway carriage looking at a drawing and, as she brings it down, being mobbed by people with their mouths covered by threads of skin; a similar scene where a nurse (Christine Lan) is waiting on a platform and a man nearby turns and reveals he has something covering his mouth that looks like it is wriggling with worms, before she jumps in front of the train; Ilona’s ride home and then the abrupt stopping of the train and, as they try to figure what to do, bloodied figures slamming up against the window. All of this seems promising. Unfortunately, about ten minutes in, Maurice Devereaux reveals what is going on and End of the Line slides quickly down into being no more than a routine B horror movie and never recovers. After this point, the film becomes one about a doomsday cult – we have seen their like in films such as Servants of Twilight (1991), Bless the Child (2000), Believers (2007), The Reaping (2007), Red State (2011) and The Invitation (2015), and this does nothing new. It also strains credibility in a major way that a wild-eyed cult would become so widespread that they could disrupt power, telephone and tv transmissions such that authorities would be caught off-guard. Soon after, the film becomes little more than the survivors being chased around the tunnels by chanting crazies with ceremonial daggers. There is no intensive tension to the siege, while the drama never gets any more interesting than debates about who can be trusted and who has wavering faith. The cult is only drawn in broad cliche strokes with little even done to give us an ideology they believe in. The reasonable jumps that we had at the start are thereafter distinctly average and presage very little. The film arrives at a cliche the-crazy-cult-was-right-all-along ending that has been used in films such as Breaking the Waves (1996), Frailty (2001), Believers, Take Shelter (2011) and Where the Devil Hides (2014).